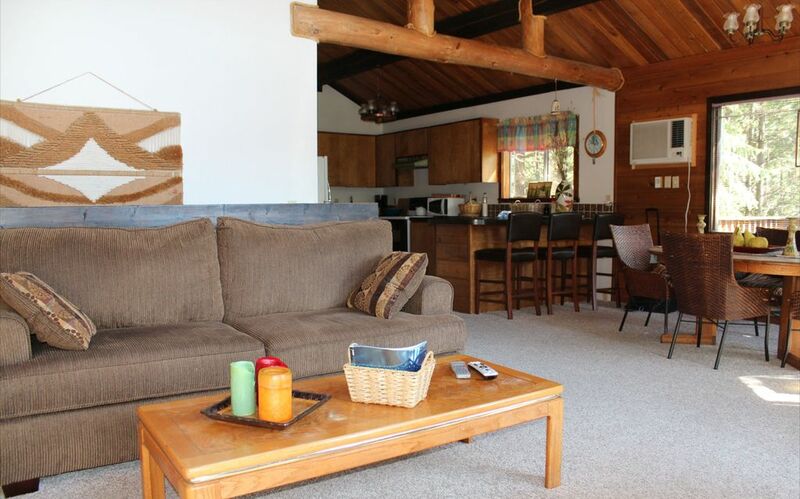 This cabin is located on Beauty Bay, which is a scenic bay nine miles east of Coeur d’Alene. The cabin is surrounded by magnificent Ponderosa Pines and is adjacent to Mineral Ridge, a well known hiking area with breathtaking views of Lake Coeur d’Alene. The lake is a short walk from the cabin and features a private beach. The trip into town will take about 15 minutes where there are excellent restaurants, city beach, movie theater and bike trails which follow beautiful Lake Coeur d'Alene or go all the way to Spokane, Washington. The cabin is also near Kellogg, Idaho, which has a number of magnificent bike trails. From the cabin’s wrap around deck, you will enjoy direct views of Beauty Bay and the surrounding mountains. You are in a relaxing and quiet location surrounded by nature but a mere 9 miles/15 minutes to Coeur d'Alene. It is truly the best of both worlds! There is a variety of locally owned restaurants, some featuring locally crafted beers. Many have outdoor seating and views of beautiful Lake Coeur d'Alene. Relax on the ample wrap around deck and enjoy scenic views of Lake Coeur d'Alene and nightly sunset. We had a lovely time in this cabin over Thansgiving. It is secluded and quiet, yet minutes feom town. With 4 adults, we had plenty of space. The kitchen is the best-equipped of any VRBO that I have ever booked. The owner’s brother even brought us a roaster pan for our turkey! We were able to walk down the hill and see the eagles all over Beauty Bay. We had a snowfall on Friday night and one of the neighbors cleared the road with his snow plow. There were wild turkeys all over the hillside and we even saw a few deer. The deck would be lovely in warmer weather with a view of the lake. The amenities were modern and everything was spotlessly clean. We will keep this on our list for friends and family visiting the area. We loved our stay at the Beauty Bay cabin. A private beach and dock to enjoy, hiking trails nearby, beautiful views, and wildlife are abundant. The cabin is rustic with some updates and was very comfortable. We did have to rig up some barriers around the top of the stairs and stairwell because our toddler could easily fit between the slats and the “baby gate” at the top of the stairs was very flimsy. The upper level floor is very squeaky and uneven but it added to the charm. We had a great time and plan on future stays at this cabin! The community was very friendly also! Very nice and quiet cabin. Great deck. Friendly neighbors. Four of us rented the cabin this June for the Ironman 70.3. It was a great experience and the hosts were very gracious. Cabin owner's brother lives next door and was available to answer any questions or concerns, but we didn't have any at all the entire stay. Great location away from downtown, but less than 20 minutes from there. We highly recommend taking the short walk to the Mineral Ridge hiking area and taking in the views from above! in such a beautiful place. We used the cabin for a Thanksgiving family get together, and it had everything we needed. It's not right on the water, but you can see the lake through the trees, and there are miles of hiking right out the door. Our dogs were welcome, and we all had a great time. This was our first time using vrbo. We were not disappointed at all. The cabin is up in the hills off the beaten track. Upon arriving we were skeptical as it looks a bit forgotten. But inside was great! Had all we needed and if we did need something, the neighbor next door(who happens to be the owners brother) was able to help. The only real issue that we all agreed on was there were quite a few cobwebs that we had to get rid of. But being in the woods, it's to be somewhat expected. We were so comfortable that we didn't bother going back into Coeur D'Alene for the July 4th fireworks. Every morning was coffee on the deck overlooking the lake. We never ate out. And on the day that we went to Silverwood Theme Park, we actually called Wayne and asked him if he would mind coming over and letting our two dogs out. He was more than willing, in fact, when we got home at 830 that night he was just coming outside with them. So he came over twice. He was the icing on the cake. Eagle watching: Lake Coeur d'Alene is a stopping point for bald eagle winter migration. Sightings are in the 100's and viewing cruises depart from the Coeur d'Alene Resort. It is awe inspiring! Rates are subject to change. PLEASE NOTE: The above rates differ for the weeks of IRON MAN and Mini Iron Man. Please inquire as to rate.